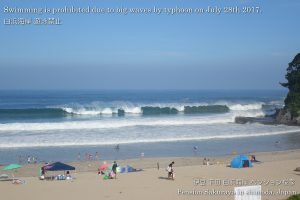 When I was cleaning the guest rooms I was able to see the big waves through the window. So I went to the beach to check the condition this late afternoon. They had much bigger waves than yesterday due to the typhoon on the Pacific ocean. 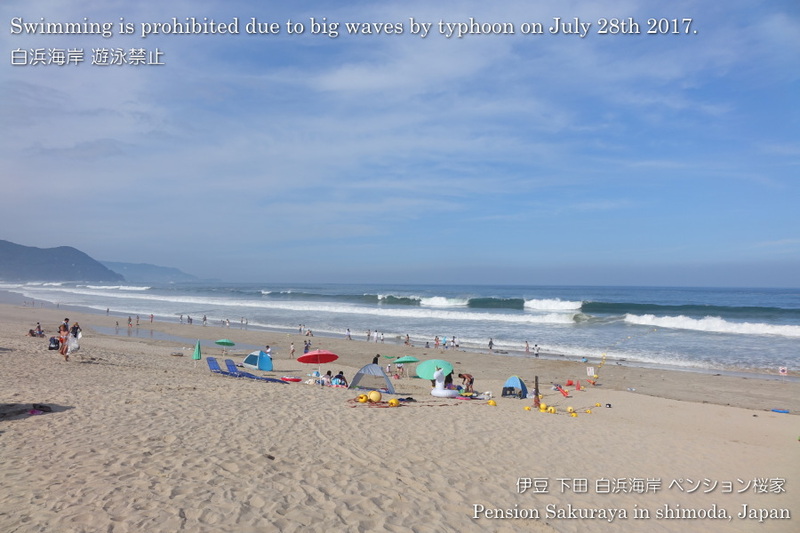 They were able to get into the water before noon, but it was prohibited to swim after noon due to the big waves. This entry was posted in beach, nature on 2017年7月28日 by izusakuraya. We have this fireworks display every summer. 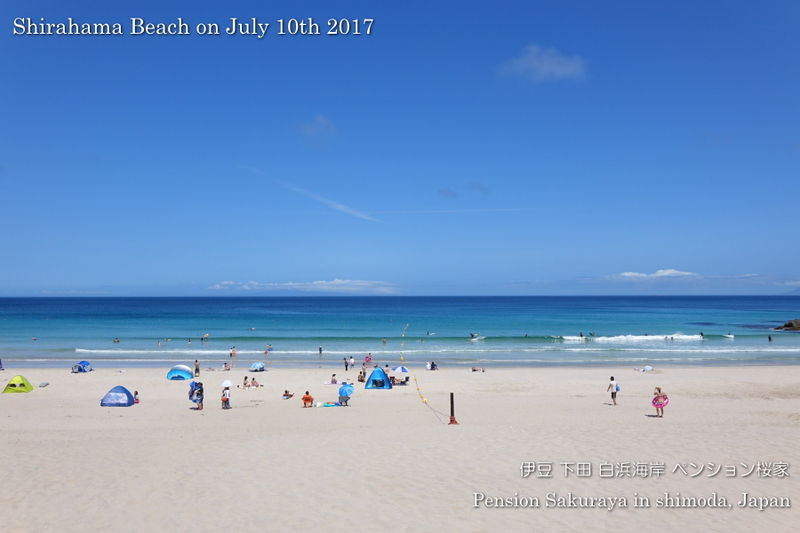 This video was taken at the end of the display. 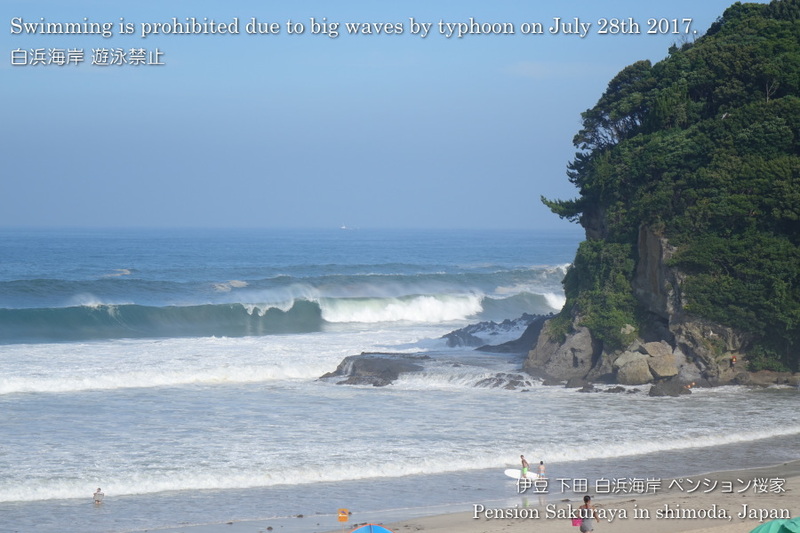 All of our customers came and stayed for this tonight, and all of them were deeply moved by this firework display. 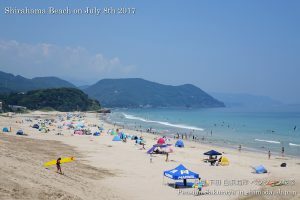 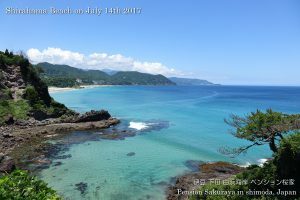 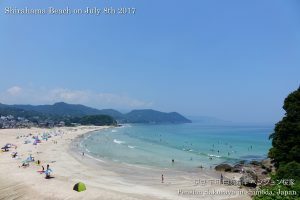 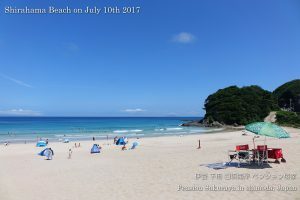 This entry was posted in beach, Travel on 2017年7月22日 by izusakuraya. I went to the nearest beach ‘Shirahama’ to take pictures before check-in time this afternoon. It was sunny and very hot again today. 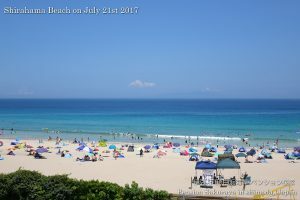 This entry was posted in beach on 2017年7月21日 by izusakuraya. 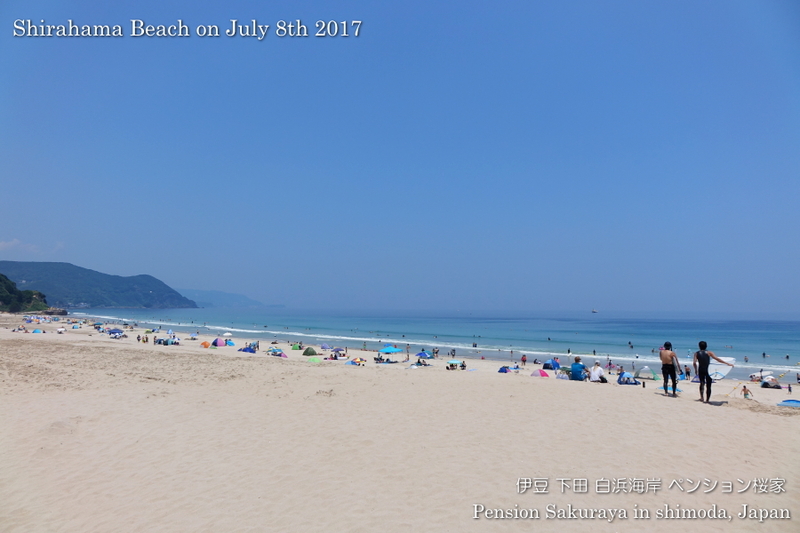 We were very busy but I went to the beach to take a video quickly. 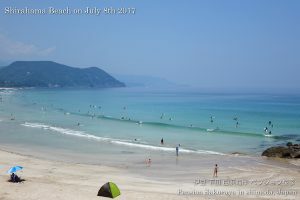 We have 3 holidays from today, so there were a lot of people on the beach. 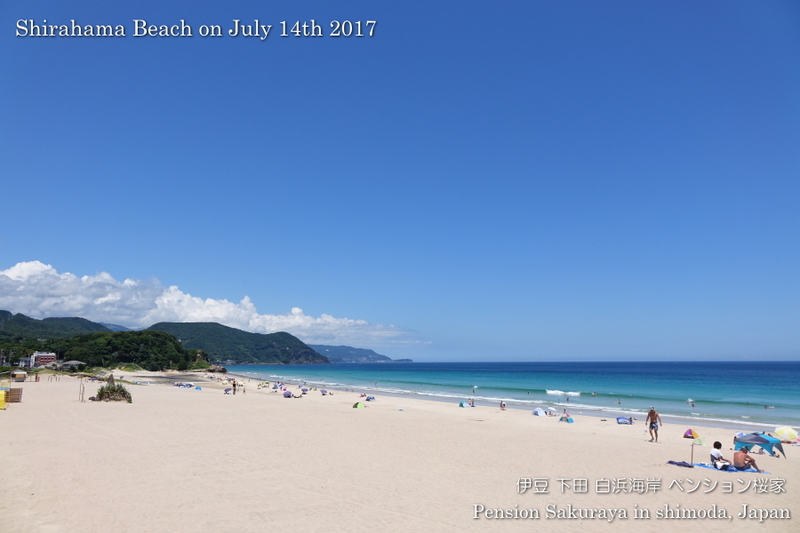 This entry was posted in beach, Video on 2017年7月15日 by izusakuraya. 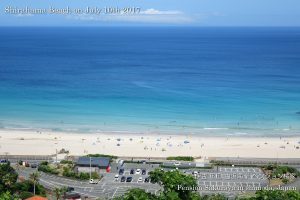 When I saw the beach through the window cleaning the guest rooms I noticed that the water had been shining under the blue sky. 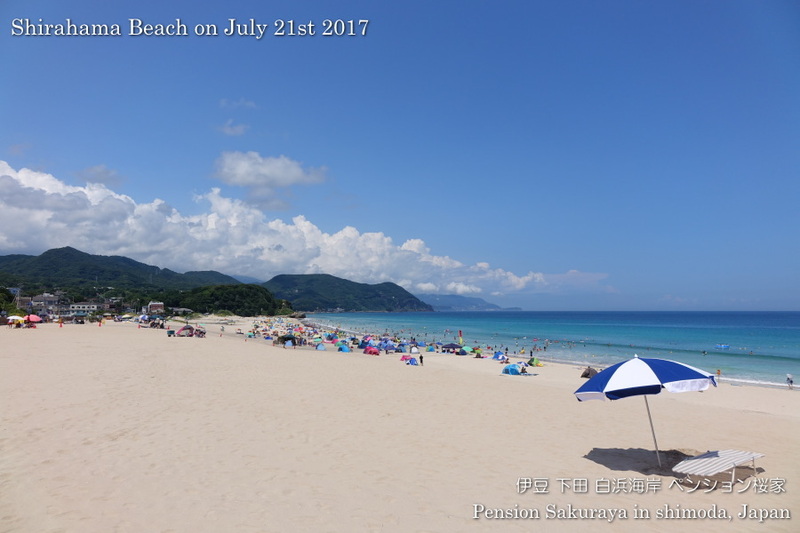 So I finished cleaning quickly and went to the beach to take pictures. 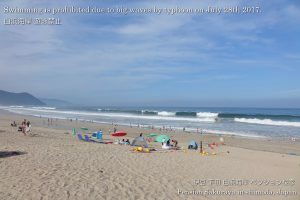 It was the perfect day for the beach today again. 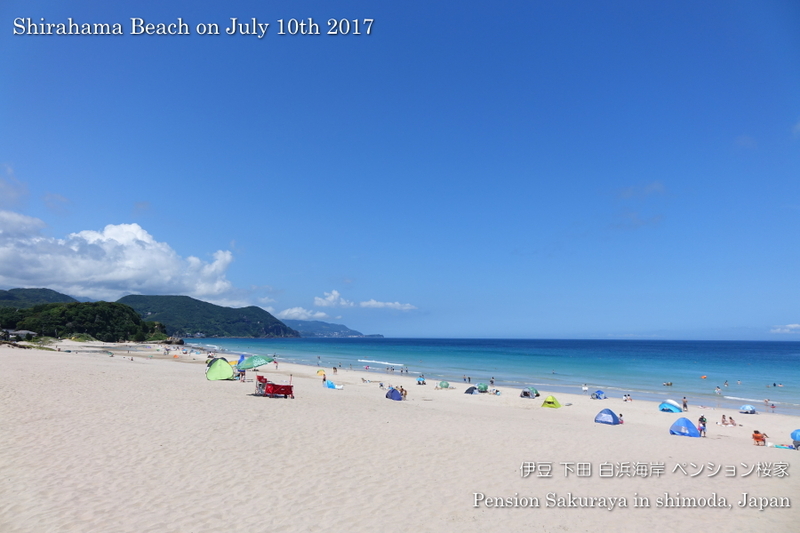 The weather forecast says it would be sunny and very hot tomorrow. 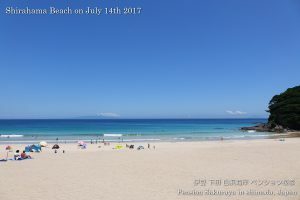 This entry was posted in beach on 2017年7月14日 by izusakuraya. 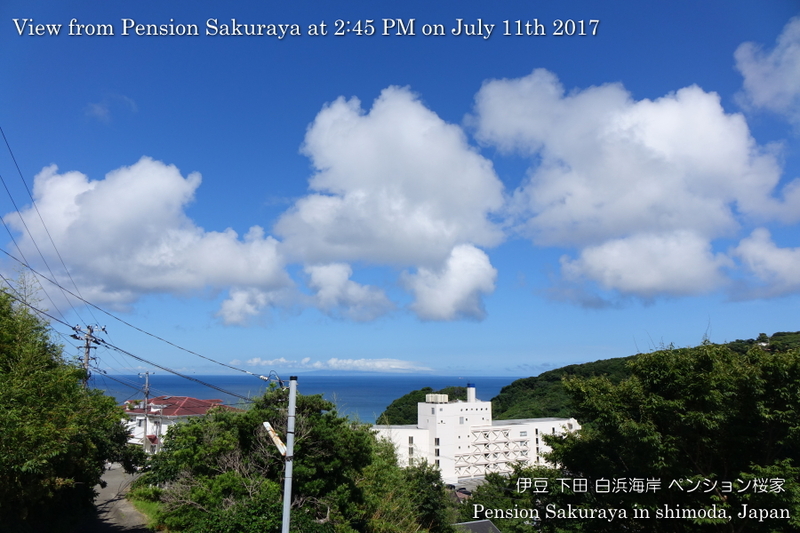 When I finished cleaning the guest rooms and saw the eastern sky there were some clouds in the sky. 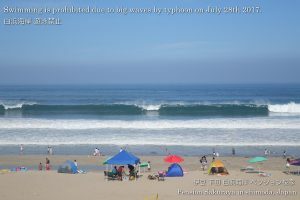 It looked like cotton candy! 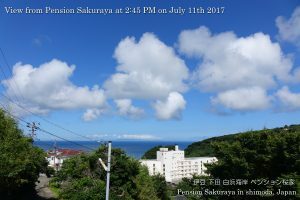 So I took this picture from the 2nd floor of Pension Sakuraya. This entry was posted in nature, Pension Sakuraya on 2017年7月11日 by izusakuraya. 2017/07/11 Thank you for staying! 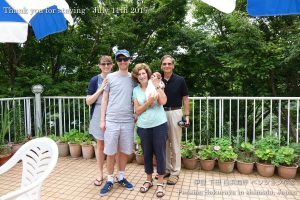 It was the 4th time for us to welcome the young couple who live in Tokyo. 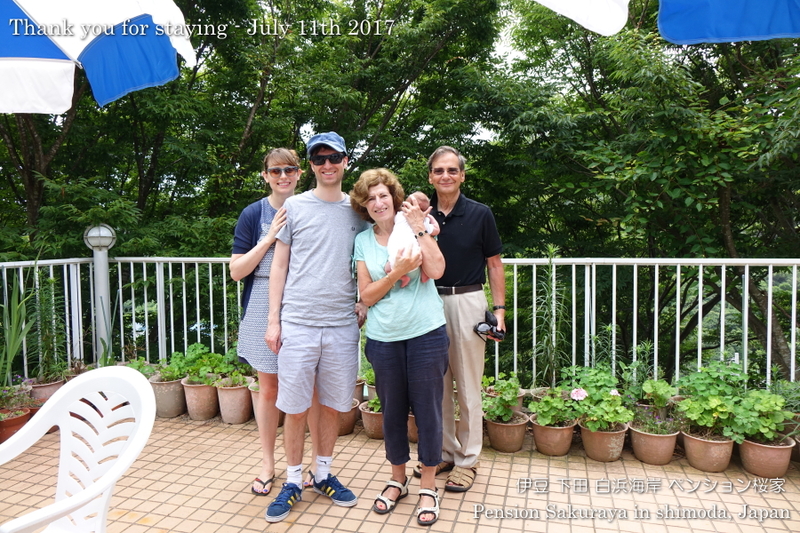 They had a new family about 4 weeks ago and their parents came from England to see the baby, and came to Shimoda all together. They went to the beach in the late afternoon on the 1st day, and went to Shimoda city for walking. 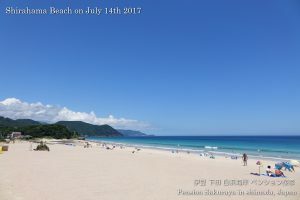 We are really looking forward to meet you and your cute angel. 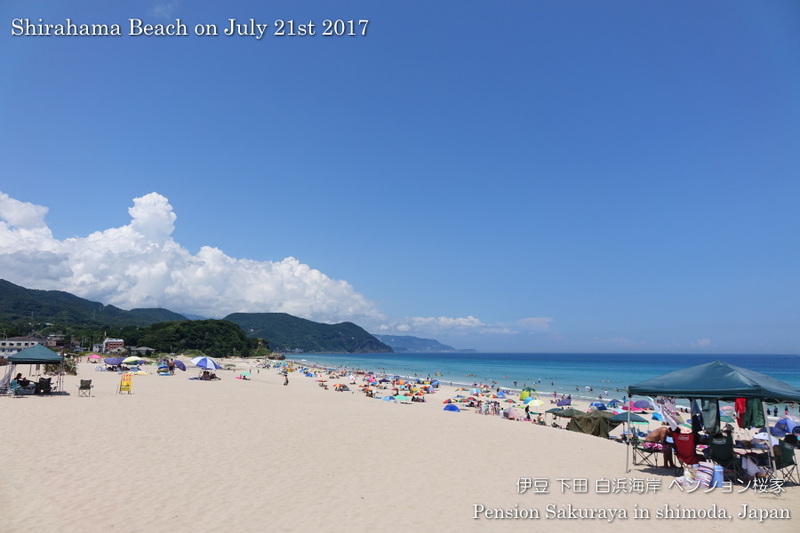 This entry was posted in Customers, Pension Sakuraya on 2017年7月11日 by izusakuraya. 2017/07/10 It looked like Southern Island Beach! 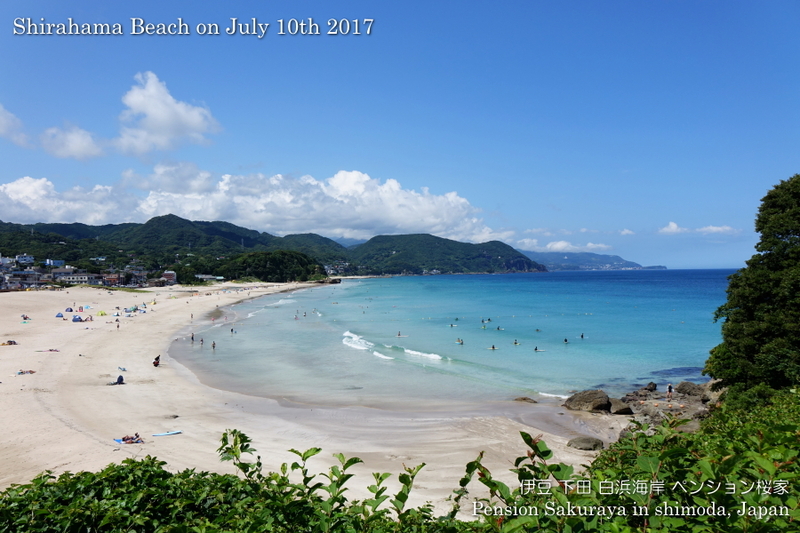 I went to the beach to take pictures after I finished preparing the guest rooms. 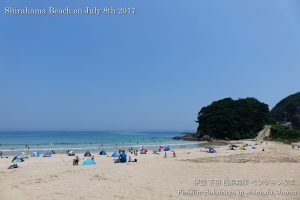 It was the perfect day for the beach, but it was too hot here in Shirahama. 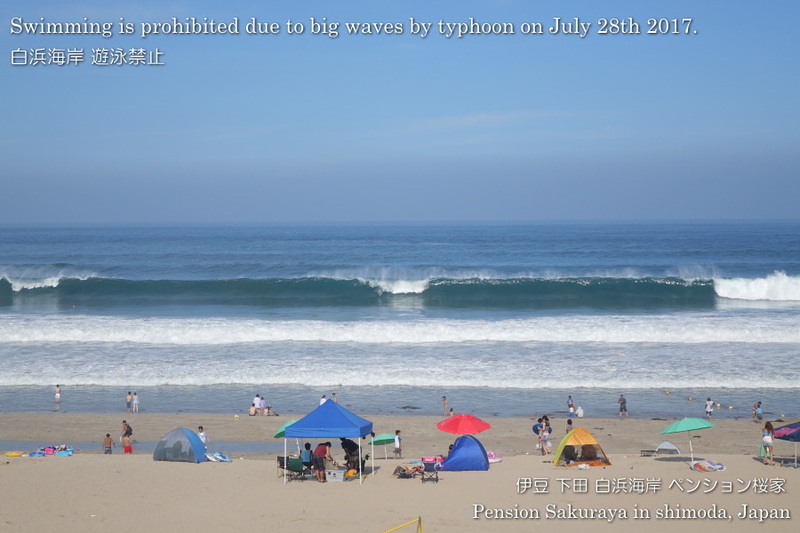 I really wanted to get into the water today! 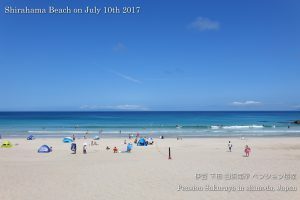 This entry was posted in beach on 2017年7月10日 by izusakuraya. I went to the beach to take pictures at around noon after I finished cleaning the guest rooms. 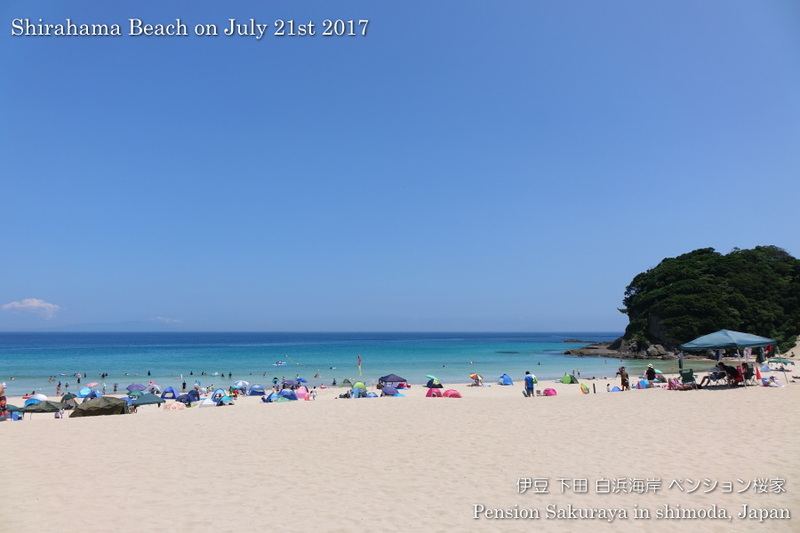 It was very hot again here in Shirahama today. 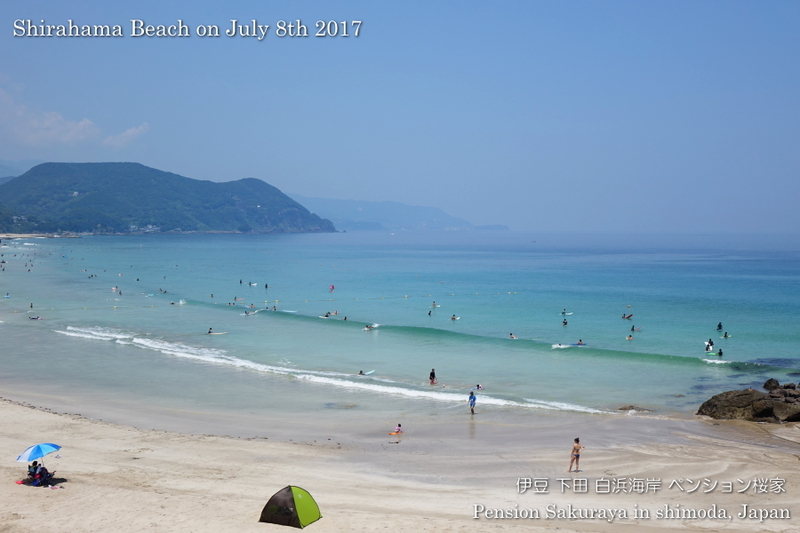 It was Saturday, so there were much more people on the beach than usual. 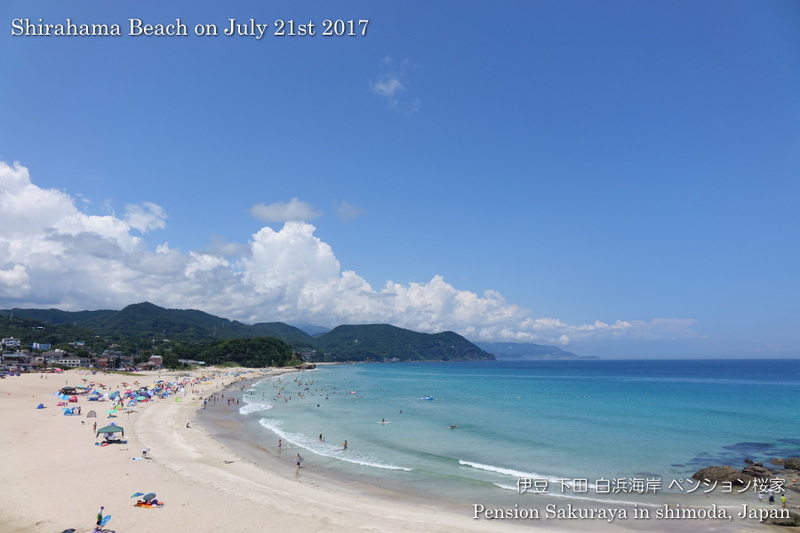 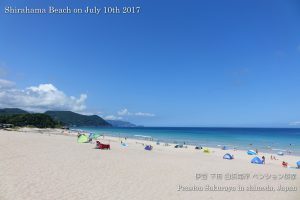 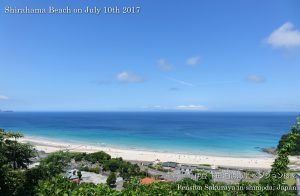 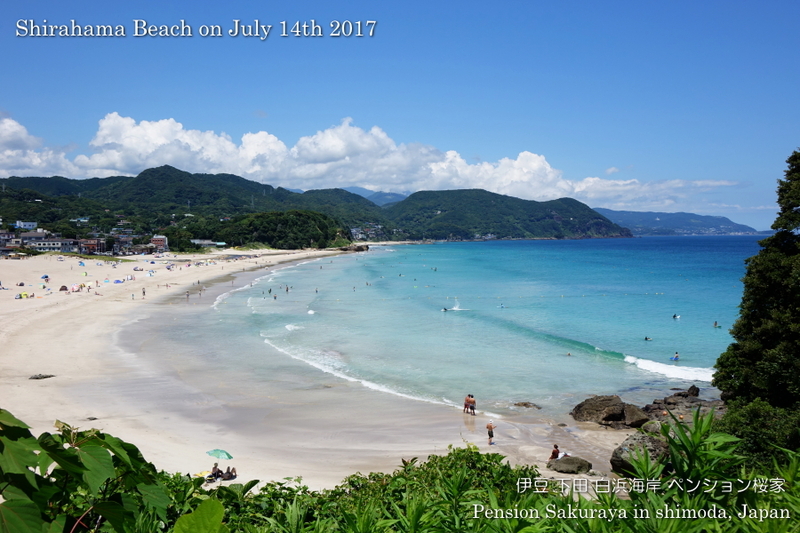 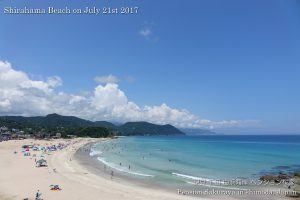 This entry was posted in beach on 2017年7月8日 by izusakuraya. This is a view from Pension Sakuraya at 4:46 AM today. 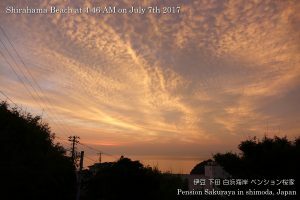 The morning glow was really beautiful this morning. 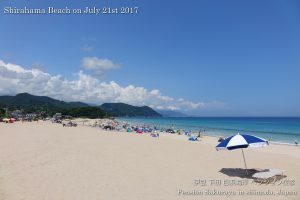 This entry was posted in nature on 2017年7月7日 by izusakuraya.